When your shovel hits a big rock in the ground, you immediately get out other tools to gently pry the rock out so you don’t scratch it all up. When you find a rock while digging, you get that same feeling you get when opening an unexpected present as you gently brush the dirt off to see what the rock looks like. When you come in from a day of gardening, you have a pocketful of rocks found here and there in the garden. You have a stockpile of rocks you dug up, just waiting to be used somewhere else in the garden. You have a bowl on your coffee table filled with some of the more interesting rocks you’ve found while digging in your garden. Other gardeners have sent you rocks because they know how much you like them. You got your uncle to give you a big rock that was once part of the foundation of your ancestors’ house, long since torn down. 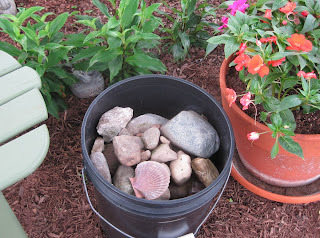 When you had to dig up your miniature garden to make way for a new patio, you made sure to gather up all the rocks from that garden and put them in a big bucket to use later. 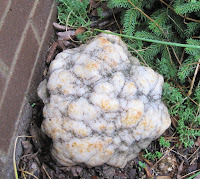 When you visit other gardeners' gardens, sometimes you ask for a rock instead of a passalong plant. You can identify with "Taci" in the Lucy/Desi classic movie, "The Long Long Trailer". I can take this one step further! Are there people who don't like rocks? That's weird! We call them potatoes around here. I never have to worry about my house sinking in an earthquake. Bucket of rocks? 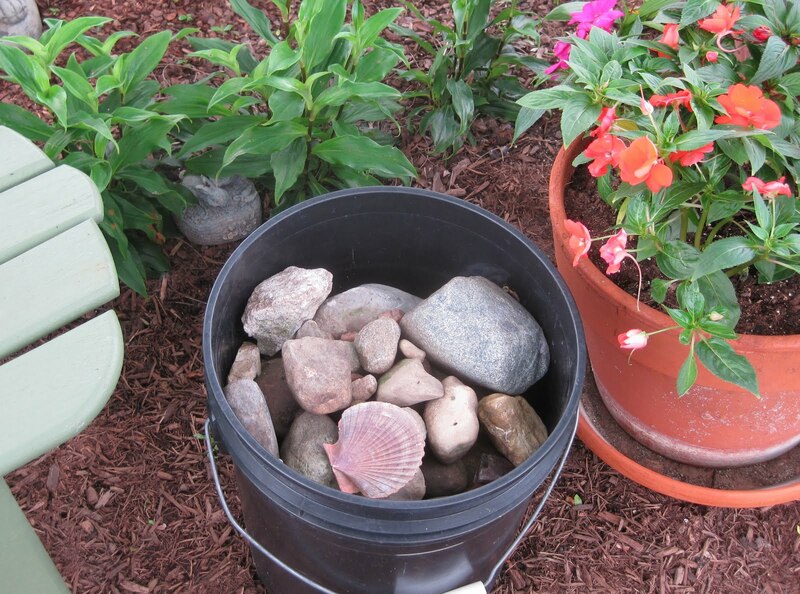 Try a garbage can full of rocks seeking a new home. I once had my brother in law and husband cart "a few good rocks" home when we visited Marble CO.
You might be a gardening geek if you inherited your mother's rocks. Then got some of your own and moved them with you when you moved 1000 miles. I'd buy that marbled cauliflower rock it's brill. I keep all our rocks, we've made many a good wall or edging and they're great for holdong down fleece too. I love rock too. It's good to know I'm not alone. My family thinks I'm nuts because I don't want the rocks taken away. And mine have fossils in them! Who would though away rocks with fossil shell imprints? There's always room for a new rock, I say. I am so glad I live in the Rocky Mountains, for there is never a shortage here! I know one you can add to your list. You are a gardening geek/ rock lover when your friends bring you rocks for your garden from their travels. Yes, to all the above. My geekiest rock story of all: DH used my love for stones as an excuse to buy a bulldozer to unearth big limestone rocks in a field. They were plowed around for 60 years to keep from breaking plow points. the largest one is 7 feet across. Yes, I've bought bags of little round river stones for projects. I've picked up rocks off the side of the road, including shards of a culvert the county road machine destroyed. Oh gosh, I am a rock geek too. When we built, we found a good mix of granite and a green stone which looks a bit like jade. I still curse my landscaper who threw a perfectly gorgeous green stone into the ravine next to us. If I could re-live that day, I would make him climb down and retrieve it. Now it's overgrown with blackberry vines. I'm a full fledged, card carrying rock geek too. 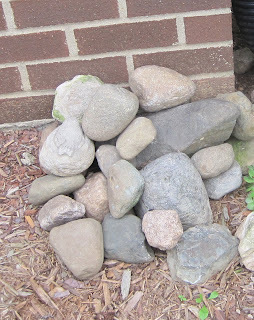 Whenever we go on a trip we bring back a rock to add to our collection, recently went on a rock hunt to add some interest to our garden and named a few of my prized rocks - like Harold who stood guard in the front yard for many years. So, I'm not the only rock geek here on earth. I even collect colorful rocks from Asia. Any friends or, relatives that comes from trips brings rock for me. As they know that nothing is precious to me than the rocks. No rocks in my garden; I'm on deep, deep clay, and part of rock geekery (IMHO) means not wanting random rock from just anywhere mixing promiscuously in my garden. I must admit that I have imported sandstone rubble for planting into, and that the nicest rocks in it are out on display! Uh oh, I'm a geek too. Rocks everywhere, but aren't they magnificent? Sorry to have missed you when I was in Brown County. I am crazy about that area. I like rocks. I've collected many smooth flat rocks from an ancestral beach in Vermont, and a friend just told me that rocks are the answer to preventing my chickens from digging up newly planted annuals. She said to place flat rocks around the new plants. 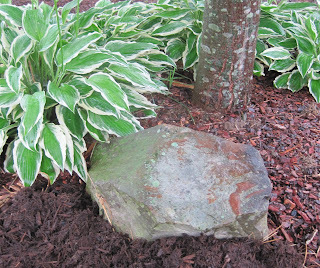 The chickens won't be able to dig up that area - and the stones act as mulch. Double duty. honey, if you want rocks, come on down! I have rocks almost literally coming out of my ears, but yes, I do use them. I made 200+ feet of stone pathway between all my raised beds using mostly rocks I'd dug out of those same beds. One rock I pulled out weighed about 700 pounds! That one took 2 people and a come-along to move. 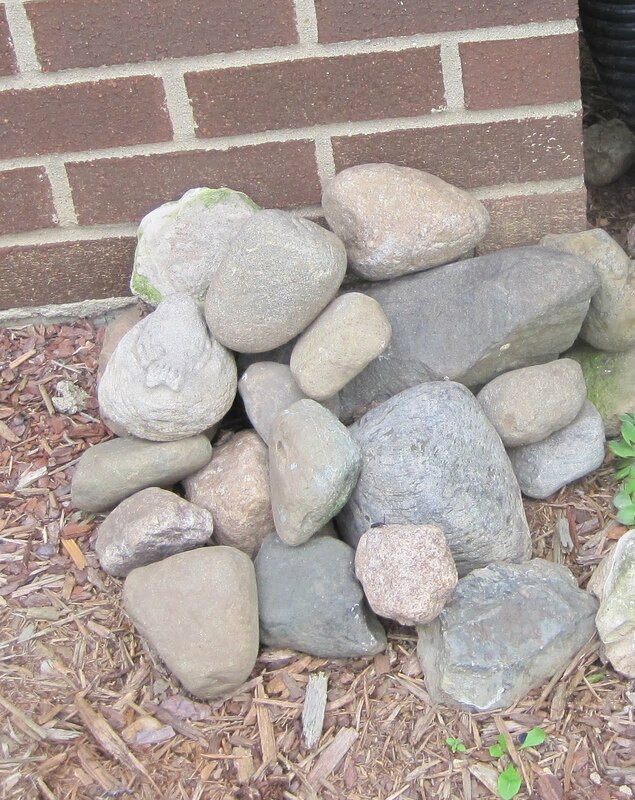 Other rocks make walls, sculptures, benches, and other walkways. When I find a good rock, I am all over it! Unfortunately, usually when I dig in the garden I hit giant pieces of asphalt and not interesting pieces of rock. I've still found uses for them in the garden, though. They outline a small bed by my deck, with more attractive rocks interspersed so the asphalt isn't so obvious. Always jealous of those with GOOD rocks! !